Are Pigeons and Doves the Same? When one thinks about common pigeons that stock the city squares and parks, one thinks about the delight of little children watching them scatter, the people who compulsively feed them and, of course, the mess they make with their droppings. Yet the pigeon’s first cousin, the dove, has been a symbol of the most cherished and noble of mankind’s dreams and hopes throughout history — love and peace. 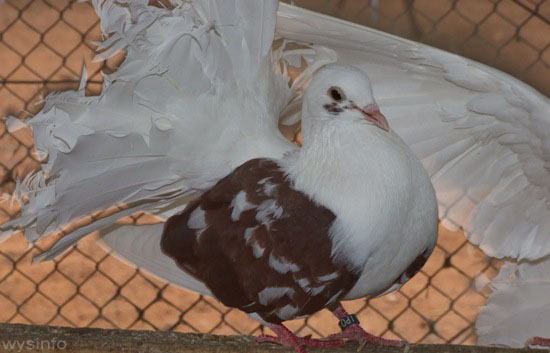 Both pigeons and doves are members of the Columbidae family. Some would argue that there is no real difference between the common pigeons and the romantic doves. 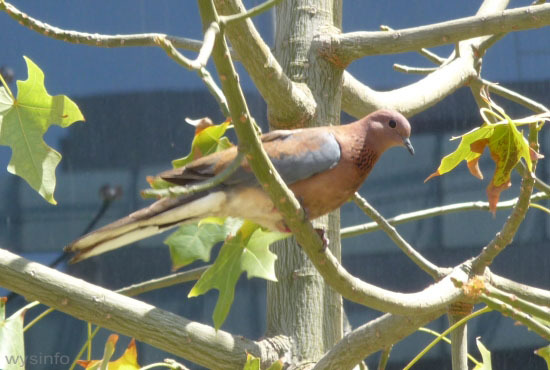 Some people, however, claim that doves are the wild version of the pigeon. 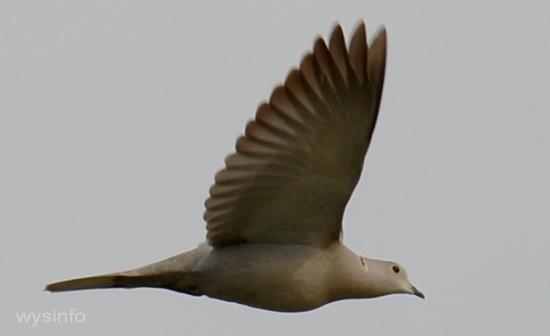 Those who distinguish between the two note that doves are generally smaller and have more delicate features than pigeons and that they were never actually cultivated like pigeons. 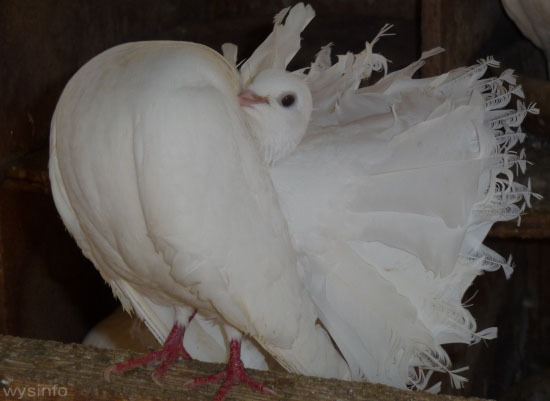 The various types of pigeons and doves is a topic all by itself – there are more than 300 species of the columbidae family living in different countries around the world. Rock Pigeons (Columba livia) – The most common variety of pigeon (the one most of us are familiar with). Originally these pigeons made their homes within the fissures of rocky crevices in order to protect themselves from natural enemies such as hawks and falcons. They typically have blue-grey to dark grey plumage on their bodies, with white feathers on the wings and tails. Their necks are garnished with greenish and lilac feathers with a distinct metallic luster. During their migratory stay they can be seen in abundance, typically close to mankind. Ring-necked Doves (Streptopelia capicola) – These doves are found mostly in woodland or farmyards. They have a black bar of feathers that form a ring around the back of their necks. You often see them sitting on tree tops. 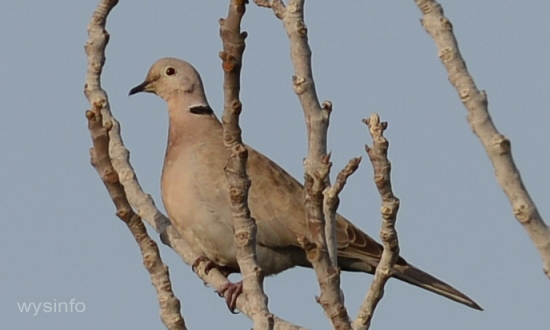 Laughing Doves (Streptopelia senegalensis) – very similar to the turtle dove but with a black spotted band across its throat and with gray brown feathers (without the spots of the turtle dove). 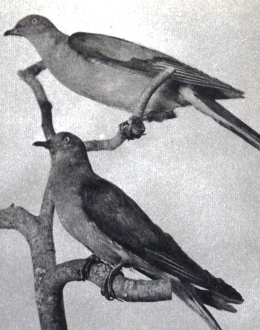 Passenger Pigeons (Ectopistes migratorius) – this pigeon once inhabited United States and Canada east of the Rocky Mountains but is now extinct. 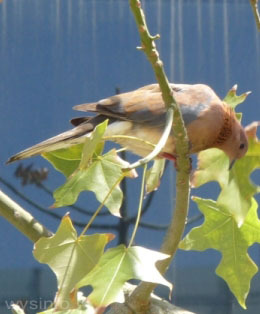 The Passenger Pigeon was slender with a long wedge-shaped tail. At one time it could be seen in the millions but, sadly, became extinct – most probably because it was killed off for food. The last wild specimen of the passenger pigeon was recorded in 1899 and the last one in captivity (named Martha) died in 1914 in the Cincinnati Zoo. Racing, Homing & Messenger Pigeons – were bred deliberately to enhance both their natural orientation capabilities and their ability to fly great distances at high speeds. Some racing pigeons have been registered as flying from as far as 600 miles from their homing location at about 50-55 miles per hour. 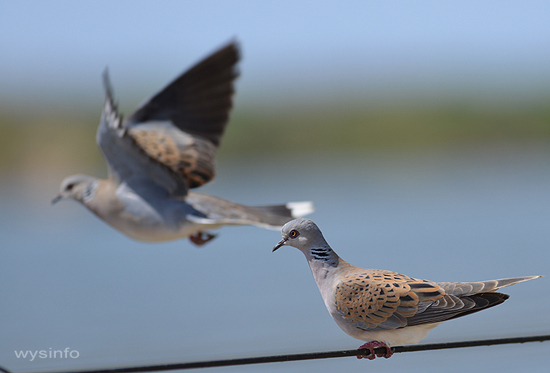 There have even been records of pigeons flying from as far as 1000 miles (1600 km). Tumblers, Rollers and High flyers – selectively bred with a special emphasis on their powers of flight. Good high flyers, the moment they are released, rise rapidly in spirals to great heights. Tumblers are distinguished by their sharp somersaults and turns at full speed. Chinese owls – originating from Asia, these pigeons have unique feathering on their breasts that points upward. There are various other types of owl pigeons, such as African Owls, English Owls etc. 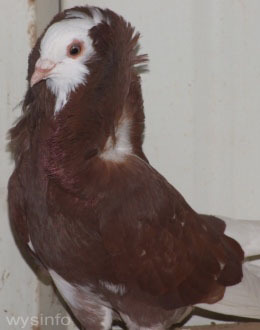 Fantails – one of the oldest varieties of pigeons that were specifically bred for their feathering. These pigeons have beautiful fan-shaped tails. 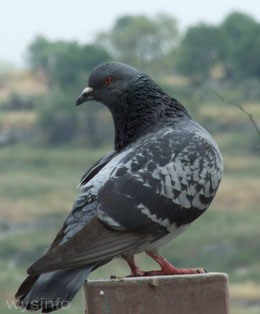 This type of pigeon was brought from India to Europe in the 16th Century. 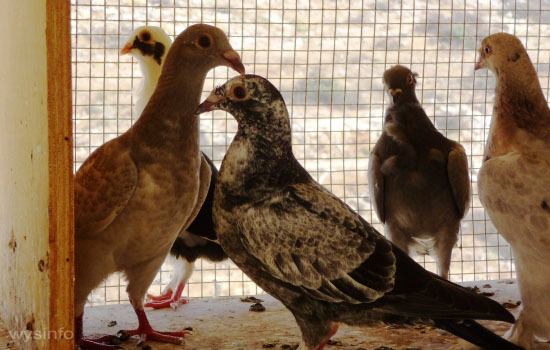 For interesting information about Pigeon Fanciers and how pigeon characteristics are evaluated, see our Pigeon Breeding page. 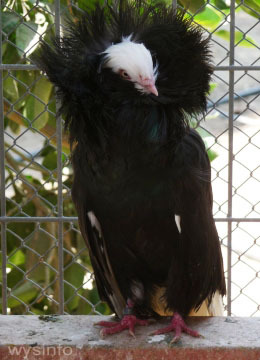 Frillbacks – this is a fancy pigeon bred for its unusual frilled feathers. Its origins are unknown, but may have come from the Netherlands. 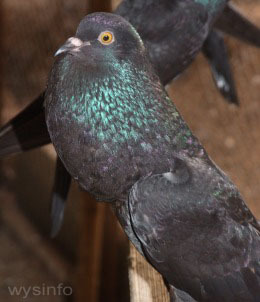 These pigeons were already cultivated in the first half of the 18th century in Germany and England. Crowned Pigeons (Goura cristata) – has plumage in shades of blue with a striking blue fan-like crest on its head. (No picture available). Jacobins (Columba livia jacobin) – this type of pigeon has striking feather ornaments around its head. These feathers are very long and the two sides tend to cross over each other. 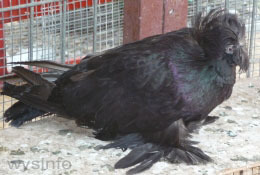 A close cousin to the Jacobin is the Capuchine pigeon which also has distinct feathers around its heads – but the feathers are not as long as those of the Jacobin. Trumpeters – noted for their voice which resembles the sound of a distant drum. There are many different types of Trumpeters, such as the German Trumpeter, with a crest at its nape, or the Bukhara Trumpeter (sometimes referred to as Russian Trumpeters). Carriers belong to the wattled pigeon group, which are distinguished by the large growths (referred to as wattles) on their beaks. The Carrier pigeons, originating from Egypt and the orient, have been reared in England for more than 300 years. 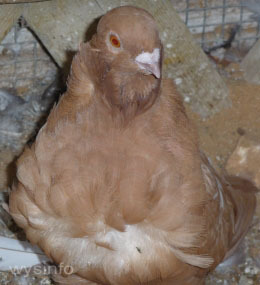 All pigeons inflate their throats when cooing, but the Pouters and croppers were deliberately bred to enhance this characteristic. 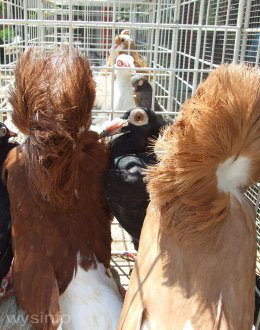 English Pouter – already bred in Great Britain more than 250 years ago; another example is the Brunner Pouter, smaller and more slender and occurring in several colors. 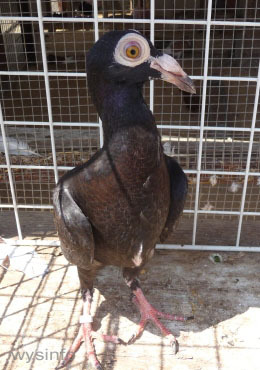 Voorburg Cropper (shown below) Like all fancy pigeons, owners work very hard to maximize a specific characteristic and prizes are given to the most impressive. 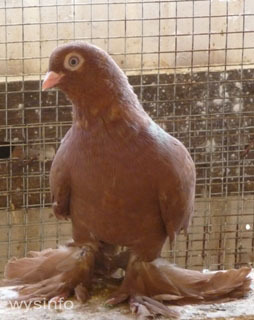 Pigeons of special coloring such as Archangels (Gimple) – believed to have originated in the area around the Bulkan peninsula. 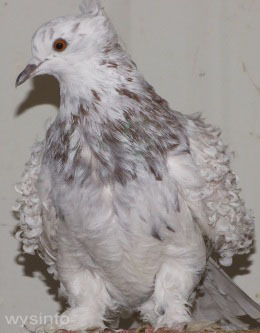 The feathers on the back of this pigeon’s neck overlap and culminate in a pointed peak of feathers at the top of its head. 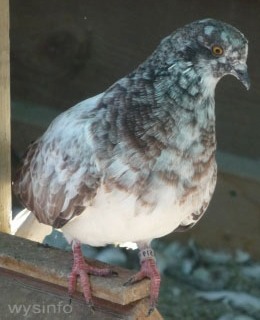 This type of pigeon comes in many different colors and in some cases the coloring is quite striking. 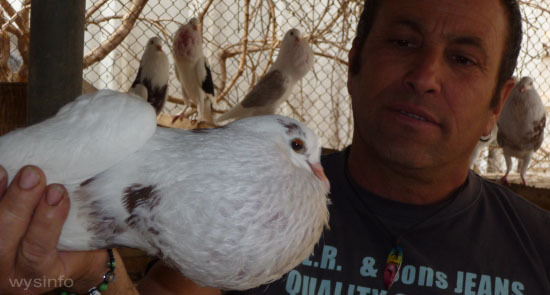 Pigeons raised as livestock for food, such as King Pigeons. And many more, including also a great variety of mixed breeds. 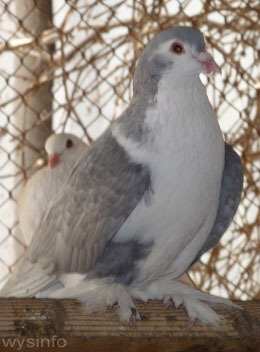 For more pictures of different pigeon breeds, see the Pigeon Breeding page of this docuweb. 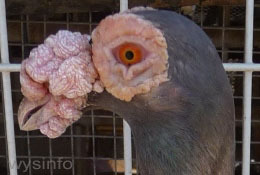 You may have noticed that pigeons’ necks – even the common pigeon – can appear short and puffed out at one time and then, a few minutes later, thin and elongated. The pigeon’s neck is not only visually interesting. 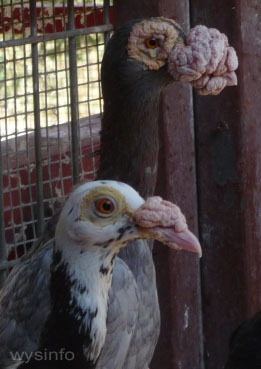 Unlike most other birds, the pigeon has a special chamber within its neck – called the crop – that becomes very developed during the breeding period. This chamber is used as a storage organ that can hold a large amount of cereal grains and, a fascinating characteristic of the pigeon, this chamber produces special high nutrient milk for the young pigeon babies. Most birds feed their babies grains, seeds or worms and insects — milk for babies makes us think more of mammals than birds. While this process of providing milk to the young seems unusual, pigeons are not the only birds that have this trait – flamingos and certain types of penguins also produce a type of crop milk. 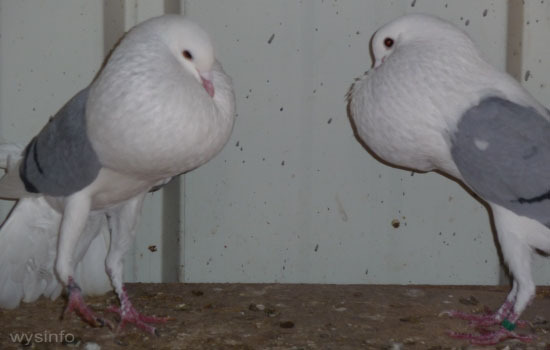 Unlike mammals, however,in the columbidae family both sexes produce this milk and both are as active in feeding the young babies. The young have soft bills which they poke inside the bills of the adults in order to feed. The pigeon’s crop milk contains more protein and fat than human milk and is all that a baby pigeon requires for the first week of its life. 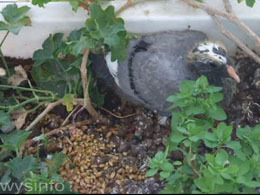 After the first week, the baby is introduced to partially digested grains – but like human infants, the baby has to be weaned off the milk gradually.Even after the young pigeon learns to eat the seeds, the parents continue to feed the young from their crops, right up until the baby can fly. (See our unique video of a father feeding the baby in order to entice him into flying). Another fascinating characteristic of the common pigeon is its natural homing instinct. Once pigeons establish a home in a specific place they are not inclined to move to a new location, and they can find their way back to this home from hundreds of kilometers away – even if they are taken to locations that are totally unfamiliar to them. This natural tendency was recognized and cultivated already thousands of years ago, resulting in a whole breed of pigeons referred to as homing pigeons and – when used for sending messages – as messenger pigeons. 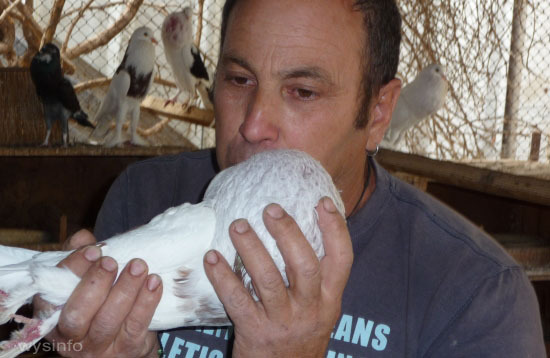 Today there are thousands of people all around the world who cultivate homing pigeons and race them for sport. 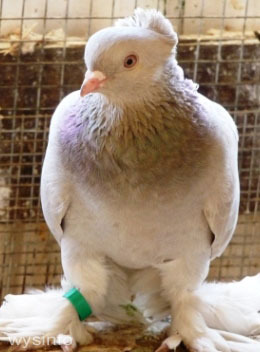 This sport involves marking the pigeons, usually on their legs, in order to identify them. They are taken out to a designated location and then set free in order to have them race back to their home loft. The homing instinct clearly depends on some kind of sophisticated navigation system – but the exact nature of this phenomenon is still a subject of much debate. Generally people today believe that this instinct depends on a number of different factors – evaluating location based on the direction of the sun or other natural light sources, an ability to sense the magnetic pull of the earth, a highly developed sense of smell and visual recognition of familiar objects near their home. In short – the same types of things that experienced navigators would depend on if dropped off in an unknown location – they would look at the location of the sun and stars, use a compass, and then look around them to watch for (identify) familiar physical terrain.